Organic. Quinoa is a complete protein, meaning it contains all 9 of the essential amino acids. 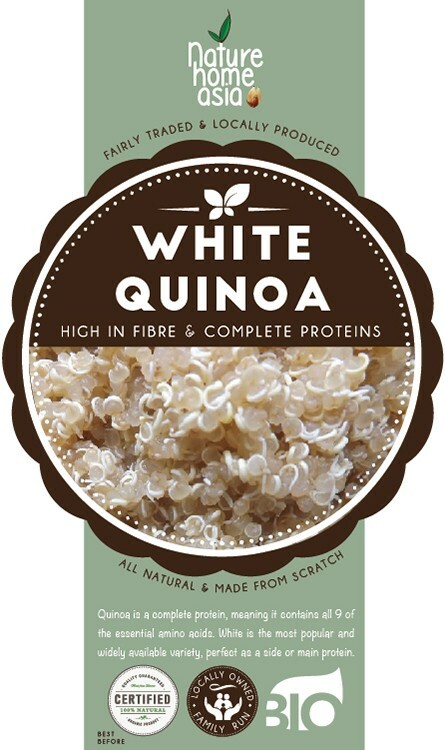 White quinoa is the most popular and widely available variety, perfect as a side or main protein. Origin Bolivia. Royal Quinoa. Just arrived - Packed with higher vitamins and quality. Quinoa has grown in popularity in recent years as the no 1 Superfood to add to your diet. It’s unusual appearance and delicious nutty texture, works with any dish, whilst being packed with protein and easy use. The perfect gluten free addition to a healthy lifestyle. A few years ago Quinoa was relatively unheard of, but now it’s becoming common place in cafes, kitchens and restaurants across the globe. Quinoa (pronounced “keen-wah”) is an incredibly nutritious grain-like seed coming from goosefoot family plant that is native to the highland plains of South-American Andes region. Ancient Incas believed quinoa as “the mother grain” and that eating it would give them a prolonged and healthy life. The crop was once the staple food sources of Incas and South America where it was grown freely and is now becoming common place ingredient all over the world. Quinoa does not belong to the cereal-class of staple grains. Instead, it is a seed, much similar to amaranth, and legume family plants. Its seeds have less fat content than oil seeds, are high in protein and a perfect replacement for other grains which have a much lower nutritional profile. They are perfect for anyone who wants to stay gluten free and are a delicious addition to your diet. The quinoa plant reaches about 3-6 feet in height and prefers well-drained, neutral PH and sandy soil. For this reason, it is being cultivated as one of the chief crops under rain-shadow highlands of Bolivia, Peru, Chile and Ecuador since ancient times. At its natural habitat, quinoa begins flowering in July which then develops into edible seeds by the end of August through September. 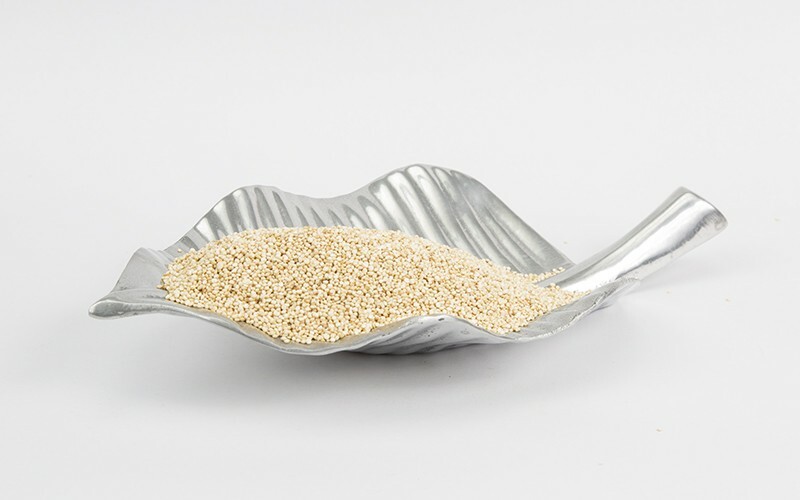 Quinoa seeds measure about two mm in diameter, and have an unusual shape when cooked that look great in salads. It comes in a variety of colours from white, gray, pink to light-brown colors depending upon the cultivar type. Each one has a slightly different taste, white being the most plain in flavour. Quinoa is high in protein, 14-18 g of protein per 100 g. It contains almost all of the essential amino acids required for the human body at excellent proportions, especially in lysine which is an amino acid hard to obtain in grains like wheat, maize, and rice. It’s a rich source of soluble and insoluble dietary fiber, high in B Vitamins, Vitamin A, folate and antioxidants such as lutein and carotene. It is also an excellent source of minerals like iron, copper, calcium, potassium, manganese, and magnesium. Wow...truly a marvelous superfood! What doesn’t it do? Quinoa opens and expands when cooked. It is the perfect replacement for potatoes, rice, corn or pasta as a side dish and works so well in salads when you want to make them more hearty and have a higher protein content whilst still being vegetarian or vegan. You can also use them in cakes, cookies, and muffins instead of your usual grain. You can even use it in replacement to oats for your morning cereal. So delicious. See our recipe section for our heavenly quinoa porridge! When preparing Quinoa, wash in cold water repeatedly until all of its foam disappears before cooking. Quinoa cooked in the same way as you cook other staples like buckwheat, rice, etc. Roughly, one cup of dry grains cooks to three cups. Cooked quinoa becomes fluffy, chewy with a pleasant nutty taste. Our white Quinoa has a subtle flavour and is softer than our Red and Black Quinoa. It is the perfect replacement for potatoes or rice, as an accompaniment to a more rich dish. Ditch the boring white rice and add this Superfood to your meals!